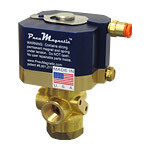 Quakertown, PA, November 19, 2009 – PneuMagnetic, a manufacturer of solenoid valve actuators which can reduce valve installation costs by up to 50%, announces a new line of actuators compatible with the 6-watt ASCO® 8320 series of 3/2 port-in-body valves. This expands PneuMagnetic's offerings to cover 21 more of ASCO®'s popular valves, thereby providing opportunities for valve installation savings in a much broader range of applications. "PneuMagnetic is proud to demonstrate its commitment to continual expansion of its product line, and growth of its ASCO®-compatible solutions in particular," according to Robert Altonji, President of PneuMagnetic LLC. "The PneuMagnetic Actuator enables dramatic reductions in the installation cost of ASCO®'s 8320 series by quickly converting valves to pneumatic operation. This eliminates the need for wiring and conduit installations which typically amount to several times the cost of the valve." The PneuMagnetic Actuator is particularly cost-effective when applied in intrinsically safe (IS) and explosion proof (EX) installations. By converting electric actuators to pneumatic, the electric hazard is removed from the hazardous installation. The ASCO® 8320 series of valves require no MOPD (Minimum Operating Pressure Differential), and can be mounted in any position. The series is available in both brass and stainless steel. A key feature of the 8320 series is that all connection ports are in the valve body itself which provides for more robust mounting as well as easier installation since the valve ports are in-line with the piping system. Maintenance costs are also reduced because there is no bonnet piping connection to get in the way of accessing the valve bonnet. The PneuMagnetic actuator works seamlessly with this series, as it does in all applications. Mounting is as simple as with the original coil and valve performance is unchanged, providing full AC pressure rating without the electrical hazard. A complete list of ASCO® valves which can use the PneuMagnetic actuator is available at: http://www.pneumagnetic.com/ASCO-solenoid-valve-coils.html. All actuators are available for purchase via the website. PneuMagnetic is happy to discuss special valve applications with interested parties. PneuMagnetic designs and manufactures cost-saving and performance-enhancing products for the valve industry. PneuMagnetic technology is covered under US Patent #6,991,211. International patents are pending. For additional information about PneuMagnetic, contact a product specialist at 215-536-6262.